CUPERTINO - APPLE COMPUTER (BG BUX), the last (and only) manufacturer of single-button mice, today revealed its design for a new, ergonomic two-button mouse. Called the iWalk™, the two button mouse uses a unique elliptical trainer design to move the mouse. The user actually operates the device with his/her feet, using a motion not unlike an exercise machine. Now you can type, mouse, and get fit simultaneously. "This new design gives the user a rolling, natural feel to mousing, as opposed to linear mice which just scrape across the table," said Deirdre Crosstrain, an Apple spokesperson. "You'll be able to step up to the next level of human-computer interface with this." The new design utilizes two iFeet™, so it can gather twice as much information in the same motion, increasing resolution and decreasing the need to move the mouse as far as in traditional designs. In addition, each iFoot™ has one button, giving the entire iWalk device one more button than Apple traditionally uses. "Users will be able to use the left button for calling up menus that depend on the job the user is trying to do," said Crosstrain. "This is an entirely new concept, and it shows that Apple stepping up to the plate of innovation once again. By tomorrow, everyone will want a two-button mouse. In fact, everyone will have a two-button mouse." 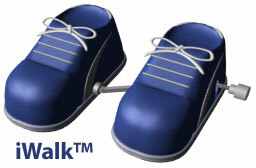 The iWalk device uses wireless technology so users can avoid tripping over their shoelaces mouse cord. Analysts responded positively - but with reservations. "Can you plug it in an iPod™ somehow?" said Delbert Numbweed of Reuters. "If you can, it will sell like gangbusters." Others were more effusive. "It's the most incredible thing I've seen since the development of those little sucker-style hooks you can put on your bathroom mirror to hold your rings," said Penny Pinochet of the Pennywise free newsletter distributed in local restaurants in Muncie, Indiana. Not everyone loves the device concept. A spokesman for Microsoft said, "Microsoft pioneered the development of two-button mice as a downgrade from the original three-button mouse," said a generic talking head (frankly, they're kind of hard to tell apart). "Apple is just copying us - and not very well at that - once again highlighting the innovation we've all come to expect from Microsoft." Gort Blanche of ApplePun, a website using a clever puns to play off of the fruit-named company's name, said of the device, "Apple has once again tread upon the competition and developed the sole product which can run roughshod over similar devices. They'll leave everyone else in their tracks, and this product will, through its amazing industrial design, set a new standard (something like 7-1/2 wide) for the development of human interface." Later in the day Microsoft announced a new mousing interface designed after the stick-shift in a 1968 Volkswagen Beetle, which will require users to use both feet, their right hand, and push on the transmission with their posterior in order to make a three-dimensional contextual menu appear. This new interface device, code named iBug™, will be available sometime in 2018, along with the first public version of Microsoft's new Foghorn™ operating system, the successor to Windows XP.